Everyone complains about the economy, but who is actually doing anything about it? 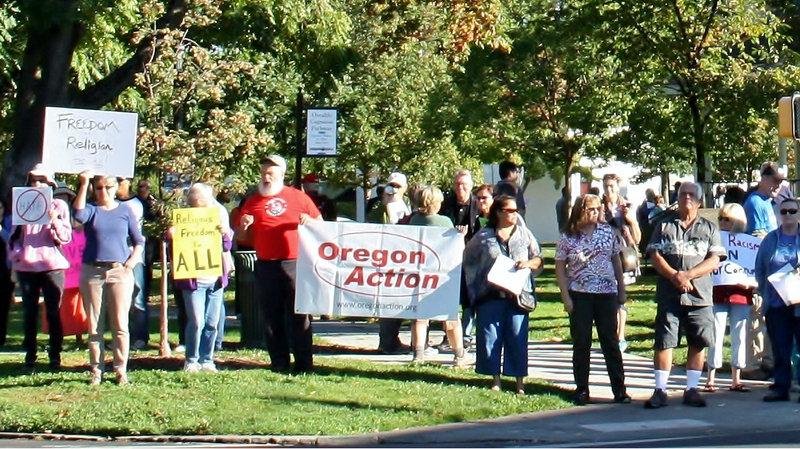 Rogue Valley Oregon Action (RVOA) is organizing local folks in Southern Oregon for economic recovery in the short term and the long term. On the short term agenda: a new green jobs program in the Rogue Valley. For the long term: the creation of the Oregon State Bank to loosen the grip Wall Street banks have on our state’s funds. RVOA has brought together unexpected community leaders and organizations to create the Southern Oregon Green Jobs Council. Their first success? The Clean Energy Works program will soon launch a home weatherization project in the Rogue Valley using federal funds. The project will create living wage jobs updating homes with insulation so that the homeowners can save on their energy bills. These “green” jobs will be living wage jobs, with benefits. Plus, a “High Road” workforce agreement will set a target that 30% of the new jobs will be for under-represented workers, including people of color, women, veterans and disabled workers. A similar pilot project by Clean Energy Works has been successful in the Portland metro area and they’ve been looking to expand. Thanks to the local organizing, the first place to get these new green jobs outside of the Portland metro area will be the Rogue Valley, and the jobs will be available to all members of the community. Besides creating jobs now, RVOA is also advocating for an approach to create jobs in the longer term: the Oregon State Bank proposal. How will an Oregon State Bank create jobs? “Right now the state of Oregon deposits billions of our tax dollars in out-of-state Wall Street banks. The Oregon State Bank can bring that money home by partnering with local banks,” explains Rich. “It’ll strengthen the local banking structure in Southern Oregon, where we need lenders for small business loans and agricultural loans.” When small businesses and farms can access loans at reasonable rates, they can hire workers, increase inventory and build their business. State bank supporters are clear that the bank doesn’t create ten jobs tomorrow, but a state bank takes banking profits and funnels them back into community investment, rather than risky speculative ventures or Wall Street bonuses. We have the model of North Dakota, whose 92-year-old state bank has been able to strengthen their state economy. It will be a tough fight, as Wall Street banks lobby to keep their hold on our local economy. But a number of grassroots groups are organizing for the state bank, including the Working Families Party of Oregon and MRG grantees Jobs with Justice, Oregon Action (of which RVOA is a chapter) and the Rural Organizing Project. RVOA will be organizing community forums in Southern Oregon for small businesses, family farmers and individuals to discuss how a state bank will create economic opportunities in Southern Oregon. To learn more about the new Clean Energy Works program in the Rogue Valley or RVOA’s work on the state bank, give them a call at (541) 772-4029. RVOA organizes low and moderate-income people in Jackson County to develop effective leadership skills and tackle the root causes of critical social and economic justice issues. With a current focus on health care and housing, RVOA is building the broad community base needed to restructure these systems and institutions.